Implements the basic elements of the multi-model inference paradigm for up to twenty species-area relationship models (SAR), using simple R list-objects and functions, as in Triantis et al. 2012 . The package is scalable and users can easily create their own model and data objects. Additional SAR related functions are provided. 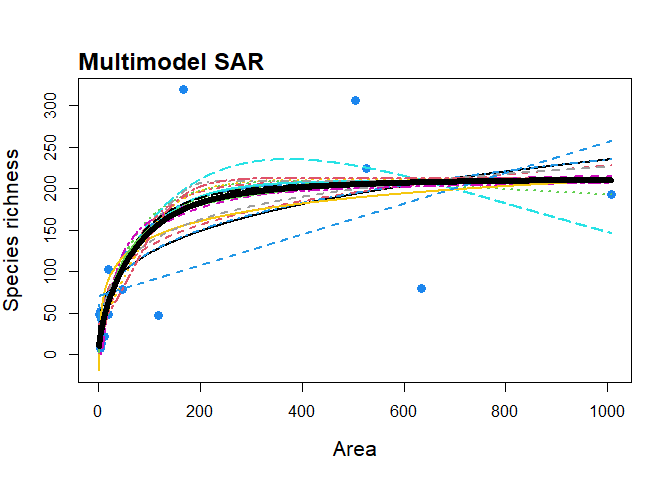 sars provides functionality to fit twenty SAR model using non-linear regression, and to calculate multi-model averaged curves using various information criteria. 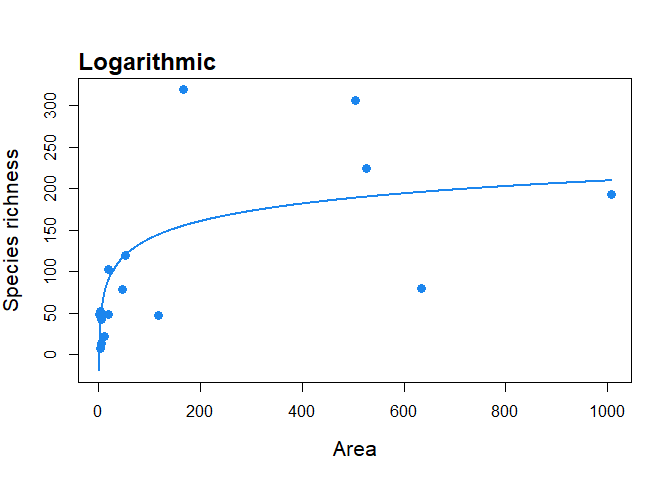 The software also provides easy to use functionality to plot multi-model SAR curves and to generate confidence intervals using bootstrapping. Additional SAR related functions include fitting the linear version of the power model and comparing parameters with the non-linear version, fitting the general dynamic model of island biogeography, and fitting the random placement model to a species abundance - site matrix. As this is version 1.1.0 of the package, it is possible that there are some bugs in places. Please report any issues to us via GitHub. The package has an associated vignette that provides examples of how to use the package. Version 1.1.1 of the package has been archived on the Zenodo research data repository (DOI: 10.5281/zenodo.2573067). #> Model fitting completed - all models succesfully fitted. Now undertaking model validation checks. Arrhenius, Olof. 1921. “Species and Area.” The Journal of Ecology 9 (1). British Ecological Society: 95. doi:10.2307/2255763. Gleason, Henry Allan. 1922. “On the Relation Between Species and Area.” Ecology 3 (2). Ecological Society of America: 158–62. doi:10.2307/1929150. Preston, F. W. 1962. “The Canonical Distribution of Commonness and Rarity: Part I.” Ecology 43 (2). Ecological Society of America: 185. doi:10.2307/1931976.